With lots of people making New Years Resolutions to get more organized, I thought I’d share some of my favorite things! however it’s been super hard to find in the last year. I think it might be phasing out. Staples has their own line of discbound products, called “Arc” so you can look for those, too. If you’ve never used a discbound notebook, it’s bound by those small disks and all of the paper and accessories are shaped so they just snap in (there’s a video in that Staples link.) There’s no opening of binder rings, and everything is movable and customizable. There’s different sizes; I use one that’s 8″x6″ and fits perfectly in my purse. I keep my whole life in a notebook like this. I have those cute dividers and I have sections for my work, my church stuff, my recipe notes, Fit Club, etc. a pocket for papers and coupons or whatever, post-it note inserts and to-do list pads, there’s tons of things you can snap in there. You can also get a hole-punch to punch anything to put in it. I didn’t want the big heavy-duty one, so I got this little one and it’s been perfect. A lot of great designers make planner-inserts for them as well, like this cute one from I Heart Organizing that comes with calendars, planning sheets, and all kinds of stuff. If you follow me on Instagram, you know how excited I get about labeling things. 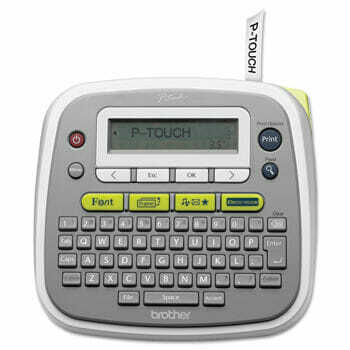 I love this little Brother P-Touch (just noticed it’s on sale in that link!) It’s super easy to use and the labels pop right out instantly, which is so much easier than formatting labels on a computer and printing them out on a sheet, or hand-writing labels. The label tape comes in fun colors like pink, blue, bright green, and yellow. (Because if there’s anything I love more than labeling, it’s color coordinated labeling.) I use this for labeling storage bins, shelves, electronic cords, containers in the pantry, kids books and electronics, you name it- I label it. At only about $40 ($29 right now on Amazon! ), this is a great little investment to get organized. I am a chronic list-maker. It’s a trait I inherited from my mother. I can still remember the weekly to-do lists she would make for me on Saturday mornings to list my chores and she would draw a little icon next to each thing, like a little shirt to signify I needed to put away my clothes. I have so many things to do, in so many areas of my life, that I just can’t survive without a good list. There are a million free organizational printables on the internet, but I’ve been using these ones from 30 Handmade Days forever. Mique makes awesome printables. Usually at night, when I’m contemplating all of the things I didn’t accomplish that day, I start a list for the next day. If you visit this link, and look for the picture below, right below it there is a link to a “generic version” and that’s the one I use. It looks like this one, only it’s completely blank. I like that because I can separate it into categories like Work, Household, Errands, Church, etc. and then during the day I try to rotate through and cross off at least a couple of things from each category. Totally works for me. With my love of list-writing, it should come as no surprise that I’m super picky about pens. These are my favorite pens in the whole entire world. They don’t bleed though paper, they come in fun colors, and they are perfectly smooth and wonderful. I use them for every day writing, but also for things like hand-lettering, and journaling in my Project Life albums. I promise you; they’re perfect. My love for lamination is no secret either. Amazon’s #1 Seller is still on a great discount from Christmas time and it’s an awesome one. I use mine a lot for things for my kids, charts we want to keep and display, visual aids for the work I do in my church’s children’s organization, etc. Once you have a laminator, you’ll suddenly want to laminate everything. And then probably put a label on it, too. At the risk of sounding like an infomercial, I’m including this one as well. I’m sure many of you, like me, made financial goals at the start of the new year. 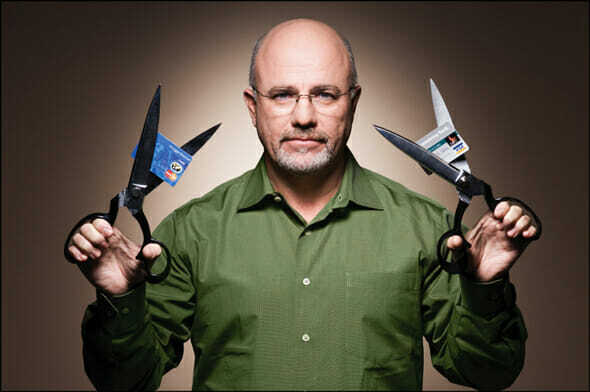 If you listen to AM talk radio, you are definitely familiar with financial guru and radio host Dave Ramsey. My husband and I have been fans for years and often listen to him while we’re driving around town. He has lots of popular books, and a whole system called “Financial Peace University“. Dave Ramsey’s goal in life is to teach people how to effectively manage (and grow) their money and most importantly, be free from debt. My husband and I are very different when it comes to finances. He is meticulously involved, brilliantly motivated and knowledgeable, and highly organized. And I am what Dave Ramsey refers to as a “free spirit.” The two of us budgeting together is always a little challenging because we have very different styles! At the start of the year though, we made some financial goals (and one of mine was to be more involved) and I can say for the first time in my life I am actually interested in finances and motivated to budget and save and become more financially organized (like my husband, haha). That in itself is saying a lot, and I attributed it all to Dave! It’s not a scheme or a ploy, it’s genuine life-advice and we’ve seen the benefits already. So- what’s on your list?? Any favorite things that help you stay organized? Organizing makes me happy 🙂 I love my label maker and my mom bought me a laminator for Christmas. I really, really like those printable to-do lists and see lots of ways that I could use them. I do ok keeping track of meetings, appointments, etc in Google Calendar, but my day-to-day list making happens in a dollar store spiral notebook. I am an obsessive list maker and what I’ve been trying to do lately is limit my daily list to what I can reasonably accomplish that day (usually no more than 5 things.) I often have lists going for today, tomorrow, this week, and “sometime.” My “to do tonight” list often goes home from work on a sticky note on the back of my phone. This notepad is one of my organizational secret weapons – I hate trying to plan dinner on my way home from work! I have several of the other notepads from that line and I want them all! Dinner is the hardest thing for me to keep organized about. I plan my meal calendar for at least every two weeks at a time and often for a month at a time. It helps me budget both my time and my money. I LOVE Dave Ramsey!! Due to his awesome program, we are debt free except for our home. It really does work! I am a free spirited person, so writing everything down stresses me out. I have to focus on just a few things to do each day. I am working full-time and an online student. I am learning to focus on a few important things and letting a lot of things go. I’m a teacher, and office supplies make me giddy. 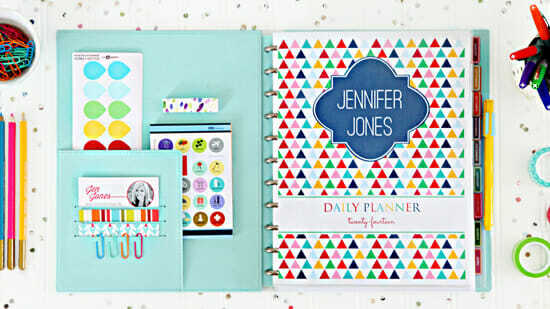 So now I am seriously coveting that planner. My planner right now is just made up of a 3-ring binder and some print out calendar pages I got off a teacher blog, maybe next year I can update to that! I actually love using my iPhone for my lists. In the reminders app I created categories like church, family, cleaning, birthdays, etc. I love having it organized there so I can go to each category and know what I need to do for each thing. I also get the satisfaction of checking things off like a regular list and can go back and see what I’ve accomplished! This year my husband and I are trying something new by keeping important papers for this year in folders in a smaller box than a filing cabinet. That way when we need to do office work we can just move the box to the kitchen table and easily put it away when we’re done. I can’t wait until we can upgrade and get a home office. I needed more organization so I got this planner from here http://intheleafytreetops.com/2015-mormon-mom-planner/. and I love it! It has helped me keep track of everything and much more. When I got a Nexus my husband wanted me to try using the calendar on it. I resisted for a while because I had a system that was working well, but I finally agreed to try it for a month as long as he understood that I was still going to use my paper calendar and that it was only a one month trial. After about a week I ditched the paper calendar and I’ve never looked back. I love having it on my computer where I can type it in, but also having it on my phone so I can schedule things when I’m away from home. I have the same laminator and just got the label maker for Christmas. I haven’t used the label maker yet, but we are about to move into a new house and I’m thinking I should use it to label where things belong while we are all getting used to the new house. Hopefully it will help us be a little more organized. I’m a pen snob too!!! I can’t believe I’m not the only one. 😉 I can’t to try those sharpies!! And….now I need some Sharpie pens. And a label maker to let everyone know they are MINE, all MINE!! Thanks for sharing 30 Handmade Days. I was printing out some to-do list template from a website, but these are way cuter and I can customize them to fit what I need. I also need to make a trip to Staples. Thanks for all the great suggestions and ideas. Diane- way back when iOS7 came out, our app wasn’t compatible and caused way too many bugs to fix. So we decided to build a better one from the ground up. We’re hoping it will be out later this year! Will you be doing one for Android as well? That would be totally awesome!! I use a hybrid system. I keep track of scheduled appointments/birthdays digitally, but do all my planning in a bulletjournal. http://www.bulletjournal.com. It seems to work best for me and has the portability, yet flexibility to make is what I need it to be. 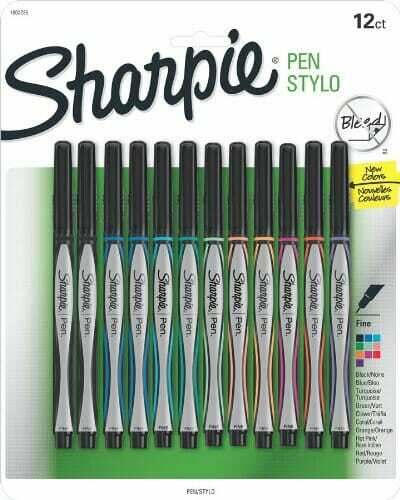 Love those Sharpies – just bought their ultra fine pens – but they aren’t really. What you showed is what I was really wanting, but have never seen! Thanks for the tip! I went back to pen and paper planning last month for the first time since college (10 years ago…ahem) and I don’t know why I ever stopped! Electronic calendars never worked for me. I also love the sharpie pens. Have you tried the ultra fine dry erase markers? The ones i have are not by sharpie, they’re from “board dudes”. But they are that same super fine tip and I can fit a lot of stuff on my dry erase calendar. We all have a color and all of our stuff fits and is legible! I got them on amazon. All that paper… I’d never be able to find anything! Before I got a smart phone, organization was just totally unattainable. If I somehow managed to keep a binder organized, the binder would somehow go missing… and usually, the binder was beyond my capabilities. Instead, I’d make random notes everywhere and lose those everywhere. My dream was to paint a wall with white board paint and just write everything there, lol. I actually sort of did that for my kitchen organization (that’s like the only vaguely organized room in my house). There are white board wall stickers you can buy, I think they’re vinyl, and they’re removable (which is important when you’re renting, like I am). The wall above my freezer is covered in them, and a couple of my cupboards are covered too. There, I write what’s in the freezer or the cupboard and what needs to be replenished. I use Evernote for everything. My school notes, my shopping lists, my wishlists, my journal, planning events, planning projects, planning anything really, recording recipes, making notes about said recipes when I try them… anything and everything you might normally use a notebook for. It’s also useful for saving stuff from the internet and transferring files between computers and devices (you can open it anywhere you have access to a web browser, even without the app installed). I also snap photos of the whiteboards I mentioned and store them in Evernote before I go grocery shopping, instead of manually re-writing the lists. I have a premium subscription to Evernote that (among other things) makes everything with text searchable. So I can snap photos of my writing or of photocopies my teacher hands out and (assuming it can make out the letters) I can find that note later by searching keywords, or search for keywords within it. CalenMob is just the best Google Calendar app I’ve found. I have it all color coded. Each person in my family has their own color and there’s another color for things we’re doing as a family (like Christmas dinners and stuff). I have another color for school and another for business deadlines (I’m a self-employed jeweler). Toodledo is maybe not something everyone needs, but I rely heavily on it. It allows me to schedule out all my jobs. I can say a client needs a weeding ring by this date, and then say when I want to complete all the steps leading up to finishing the ring. It will then prioritize everything for me. So at a glance, no matter how many projects I have going, I can figure out what I should be working on right now and avoid falling behind on anything. That said… I’m a little stationery obsessed. I love pens and journals and paper, and I follow blogs that review pens and paper… literally (Gourmet Pens, anyone? http://www.gourmetpens.com). I buy things at Staples and Chapters that I have no use for that just sit on my shelf looking pretty because I liked the texture of the paper or I’m fascinated by a pen that can write a meter a day every day for 7 years before it runs out of ink (and it has super cute designs, too http://www.chapters.indigo.ca/en-ca/Gifts/product/810988090302-item.html?). Usually these get used for things like playing Dungeons and Dragons, where I don’t necessarily want to have my smartphone out the whole time or drag my laptop along… but I can’t stop buying them, and I buy them much faster than I use them. I can’t explain it. Those Sharpie pens are the best. I have a serious love affair with them. 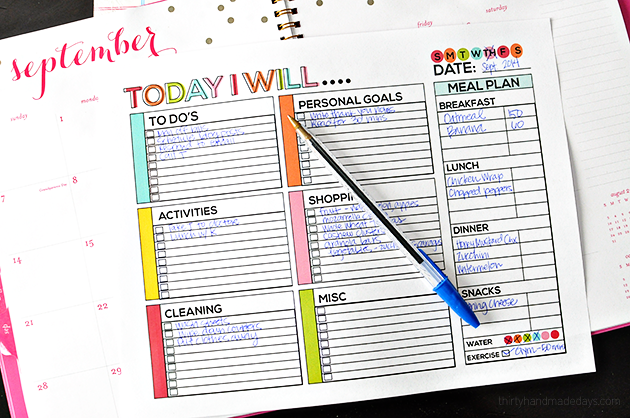 Love Plan To Eat for meal planning and grocery shopping list making. I could not live without it! Love the Project Life app for scrapbooking and also Blurb. Love Scoutbook to help me keep organized with my son’s Cub Scout pack. Love Dave Ramsey’s cash in the envelope system. It really works when you stick to it. I am a paper pencil list maker too. Hate the electronic systems. Something else I am doing to save money is the 52 week money challenge. I have been using a Lang paper weekly planner every year for many years now. I just like the paper thing–crossing it off and looking ahead to the next week. I kind of love your idea of the ones with pockets, though!! I always have papers (invitations, recipes for the week, etc.) just floating in there. Hmm…might have to finally change! My favorite financial organization thing is budgeting software called YNAB short for You Need A Budget. It is the most useful, user friendly, just what we need, best budgeting software we’ve found. We have been using it for at least 2 years now. In that time I have gotten so much better at living within our budget. As for a planner, I would like to find one that I would use for more than a month. It would make life so much simpler. Right now all I use is my wall calendar to write down events and appointments. I’ll have to take a look at the discbound planners. I so desperately want to know what software these people use to make their own planners! I am super picky about the layout of mine and just want to make my own, even the most customizable places don’t do everything I want, but making them in Word is horrible and I’m not sure what else to use. Such a fun post, thanks! I love organizing, and all things colorful. 🙂 Quick question for you: the label tapes for the label maker that you posted are all different sizes. Can you use multiple size tape? Awesome post Sara! Thanks for the heads up about the Sharpies. I love a good pen too…I am going to have to get me some! Like others, I love Dave Ramsey too! I am so excited for you guys! His stuff is awesome and I love how much it follows the teachings of the church too. We paid off our house this past summer, a few months before I turned 35. If you ever want to check out our story it’s here: http://leeandruth.blogspot.com/2014/07/revisited-our-get-out-of-debt-story.html. Happy organizing and Dave Ramsey-ing! Organizing keeps me sane. Routine doesn’t keep me sane for some reason but organization does. Oh and cleaning. I’m opposite to you. I LOVE my electronic calendar. I got a Kindle Fire HD 6 for Christmas and I fell in l-o-v-e. I use Jorte Calendar and it’s freaking awesome. I have a huge to-do list that I put in there, on my whiteboard on the fridge and post its. Post-its are AWESOME! Since I’m directionally challenged, I always write down the directions on a small piece of paper or post it then tape it onto my steering wheel as I drive to get me to where I need to be without keeping my eyes off the road for too long. I also use post its with my kids to learn numbers or the alphabet. As for pens, I’m a G2 Pilot Pen girl. I went out to buy two new black pens (since they come in packs of twos for a color) because I lost one black pen that I keep in my purse. It made me sad and not myself when I lost that one black pen even though I had a spare one. I enjoy their extra fine point pens that make my handwriting beautiful even if they probably don’t look like it. They make them readable anyway (haha). I haven’t tried the Sharpie pens. They look like fun! 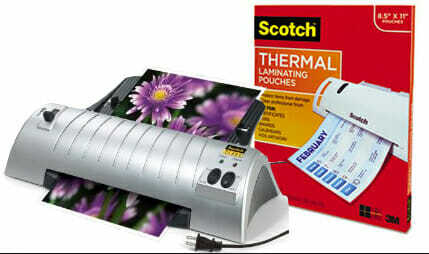 Laminators. I got one for Christmas and use it all the time. I laminate coloring sheets and activity sheets from old Friend magazines for my kids to color on during church. I’m lucky that my kids enjoy coloring and I made them crayon rolls for Christmas with 8 crayons. Easy-peasy.